We offer a wide variety of comprehensive services for the diagnosis and treatment of lameness and performance problems. 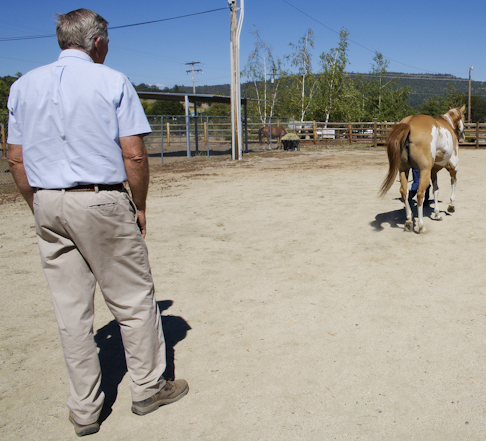 Our veterinarians have extensive training and expertise in evaluating problems in a variety of equine breeds and disciplines and are committed to constantly upgrading their knowledge through continuing education. The imaging modalities of digital radiography, digital ultrasound and digital video endoscopy (including gastroscopy) are all available at Rogue Equine Hospital for extremely accurate diagnoses. Along with the more common intraarticular medications and systemic treatments, such as joint injections, we also offer the treatment modalities of extracorporeal shock wave therapy, stem cell therapy, autologous conditioned plasma (IRAP), platelet rich plasma (PRP) and ultrasound guided injection. Chiropractic and acupuncture are also offered by staff veterinarians certified in these complementary therapies. Shockwave therapy promotes faster, more thorough healing and reduces scar tissue. Shock wave therapy is a non-invasive procedure, successful where conventional therapies fail. Shock wave not only promotes and speeds up the healing process, but ultimately causes various soft tissue injuries to heal more thoroughly with less fibrous tissue accumulation. A shock-wave unit consists of a box that generates the acoustic waves connected to a wand that can be held up to the body to target the waves to a specific site of treatment. Contrary to what its name implies, shock wave therapy does not use electrical pulses, but rather high-energy sound waves. These high energy sound waves can easily pass through fluid filled structures like skin, fat, and muscle. These waves do not pass through tendons, ligaments or bone. When the sound waves hit these structures they “crash” and release energy. The released energy penetrates the surrounding tissue and increases blood flow to the area. This stimulates various cells, which are responsible for tissue repair of the injured structures. Athletic horses can suffer inflammation of the suspensory ligament in the front leg, and shock wave therapy has been effective in reducing pain and promoting healing of this ligament. In addition to providing healing and anti-inflammatory properties, shock wave therapy works two ways to reduce pain. Its anti-inflammatory action reduces the amount of inflammatory biochemicals that cause pain. It also seems to temporarily disrupt nerve impulse transmission, thus reducing the perception of pain. These pain reducing properties can be very useful for treating dogs and horses with arthritis. Other excellent uses of shock wave therapy are in the treatment of excessive scar tissue where the shock waves stimulate scar revision and in the treatment of non-union bone fractures. Pro-Stride will reduce pain associated with arthritis and deliver naturally occurring anti-inflammatory proteins. Pro-Stride Injection is capable of slowing cartilage degradation and improving mobility. 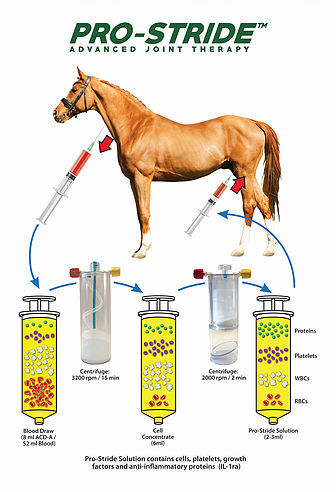 •<20 minute blood processing (no incubation) * A. Bertone, Am J Vet Res 2014; 75:141-151 ​IRAP (Interleukin 1 receptor antagonist protein) is a natural anti-inflammatory protein released by leukocytes at the site of injury. This protein is collected from blood by processing the leukocytes using a proprietary method. IRAP counteracts inflammation by blocking the inflammatory protein interleukin-1 within joints where if unblocked, can lead to pain and damage. Other IRAP devices use autologous conditioned serum, require a 24-hour incubation period, and are subsequently frozen for multiple injection aliquots. The ACT Protein Separator used with the ACT Protein Concentrator collects white blood cells and uses a proprietary method to reprogram the cells to be anti-inflammatory, secreting IRAP. Collection and activation of macrophages suppresses joint inflammation and regenerates cartilage in early stage osteoarthritic joints (canine and equine studies have clearly demonstrated efficacy). Utilizing the ACT-PRP System, platelets that travel through the blood stream can be collected into a highly concentrated formula. When platelets become activated, growth factors are released which play a significant role in the natural healing, repair and regeneration of soft and hard tissue like tendons, ligaments, muscles and bones. ACT-PRP delivers a high level of platelets capable of recruiting and proliferating cells necessary for rapid healing. In one short, simple spin, the ACT-PRP System can efficiently capture a majority of the patient’s platelets. The dual buoy is tuned to the density between platelets and red blood cells. Under centrifugal force, the dual buoy will “float” within the tube to the interface point, collecting and trapping the platelet rich layer between the bottom and top buoys. Regardless of the hematocrit of the patient, the ACT-PRP System can automatically collect a consistent, high platelet count for each patient.